1/4" Up to 1/4" 8mm * 1 3/4" 2" 8° 140-8 or 170C ** e7 or 7/16"
5/16" Up to 3/8" 8mm * 1 3/4" 2 1/8" 8° 140-8 or 170C ** e7 or 7/16"
3/8" 1/4" to 1/2" 8mm * 1 3/4" 2 1/4" 8° 140-8 or 170C ** e7 or 7/16"
7/16" 3/8" to 5/8" 8mm * 1 3/4" 2 3/8" 8° 140-8 or 170C ** e7 or 7/16"
1/2" 1/2" to 13/16" 8mm * 1 3/4" 2 9/16" 8° 140-8 or 170C ** e7 or 7/16"
11/16" 5/8" to 1" 1/2" 1 3/4" 2 3 /4" 8° 160 or 180C ** 5/8"
13/16" 1" to 1 1/4" 1/2" 1 3/4" 3" 8° 150 or 177C ** 5/8"
5/16" Up to 1" 8mm* 1 3/4 " 2 3/4" 0° - e7 or 7/16"
1 1/4 " 1/2" 1 3/4 " 3" 0° - 5/8"
1 1/4" 1/2" 1 3/4 " 4" 0° - 5/8"
1 1/4" 1/2" 1 3/4 " 3" 0° - 5/8"
1 1/4" 1/2" 1 3/4 " 3 1/2" 0° - 5/8"
*** Bits No. 80-8, 140-8 (and 120-8) are included with the D4R pro. 1 1/4” long. Required for all 8mm shank bits. 172-8 is included with Bit Sets 2411-8 and 5116-8, and all Leigh Dovetail Jigs. 1/2" 3/4" 27/64" 8mm* 1 3/4" 2 9/16" 8° e7 or 7/16"
1/2" 5/8" 23/64" 8mm* 1 3/4" 2 3/8 " 10° e7 or 7/16"
1/2" 1/2" 19/64" 8mm* 1 3/4" 2 5/16 " 12° e7 or 7/16"
1/2" 7/16" 1/4" 8mm* 1 3/4" 2 1/4" 14° e7 or 7/16"
1/2" 3/8" 3/16" 8mm* 1 3/4" 2 1/8" 18° e7 or 7/16"
*** Bits No. 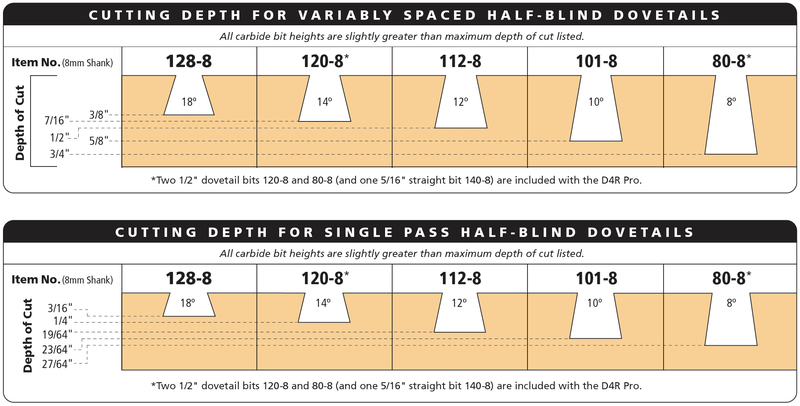 80-8, 120-8 (and straight bit 140-8) are included with the D4R pro. Includes 8mm and 1/2” shank router bits: Through dovetail bits 50-8(1/4”), 60-8(5/16”), 70-8(3/8”), 75-8(7/16”), 80-8(1/2”), 90(11/16”), 100(13/16”), 140-8(5/16”), 150(7/16”), 160(1/2”) and half-blind bits 80-8(8°), 101-8(10°), 112-8(12°), 120-8(14°), 128-8(18°). Also includes a 1/2” to 8mm collet reducer for 8mm shank bits (172-8), a 5/8” guide bushing for 1/2” shank bits (716C), and a FREE bit storage box. Includes 8mm and 1/2” shank router bits: Through dovetail bits 50-8(1/4”), 60-8(5/16”), 70-8(3/8”), 75-8(7/16”), 90(11/16”), 100(13/16”), 150(7/16”), 160(1/2”) and half-blind bits 101-8(10°), 112-8(12°), 128-8(18°). Also includes a 1/2” to 8mm collet reducer for 8mm shank bits (172-8), a 5/8” guide bushing for 1/2” shank bits (716C), and a FREE bit storage box. Includes Through Dovetail bits (8°) 50-8(1/4”), 60-8(5/16”), 70-8(3/8”), 75-8(7/16”) and Half-blind bits 101-8(10°), 112-8(12°), 128-8(18°) and a FREE bit storage box.